We offer Ten styles of Custom-Imprinted Foam Cups, each available with your logo/message. An excellent choice for both hot or cold beverages and foods, our Foam Cups come in 4 to 32 ounce sizes. Travel lids are available for our entire selection of Foam Cups. Multi-color imprints are available on all Foam Cup orders over 250 pieces (the cups themselves feature a standard white coloration). Normal production time is five working days. Rush production/delivery is available. No extra charge for same color second side imprint, but you must request it at time of order. Our foam cups contain no CFCs that harm the ozone layer, and expanded polystyrene foam is recyclable. 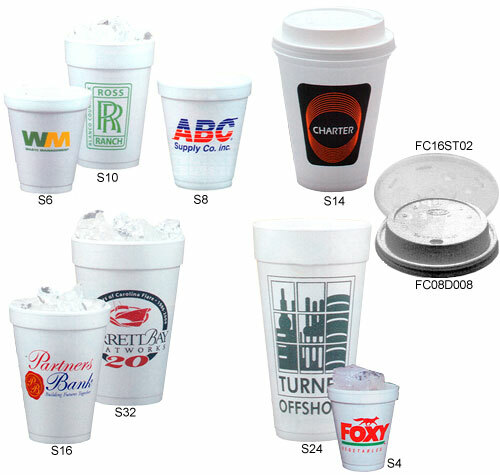 Please call 1-800-233-0828 to order or for additional information on any of our Foam Cups. Feel free to browse our wide selection of Custom-Imprinted Glasses, Custom-Imprinted Plastic Glasses, and Custom-Imprinted Paper Cups.